After the success of my first jumpsuit, I was ready to make another quickly. I had also bought one in a sale, so I had 2 in my wardrobe! 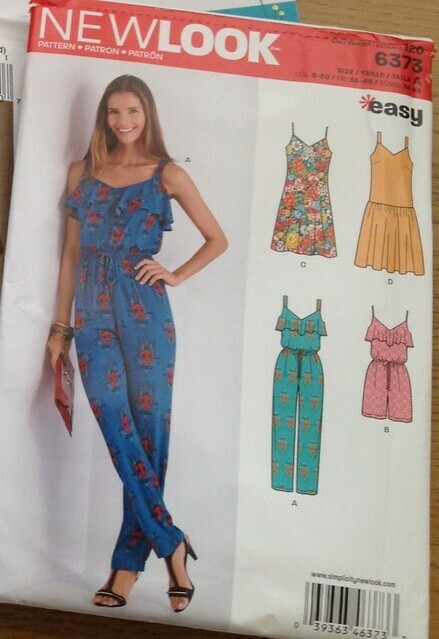 The third one was to be the New Look 6373 View B; a jumpsuit with shorts, a flounce around the neckline and a button closure at the back. I used the black & pink floral cotton as I loved how light my other jumpsuit felt – same material just in blue & orange! The make had been cut out for around 3 weeks before I decided to make it. I wasn’t purposely putting it off, other things just got in the way. It turned out that Adam was having a night out so I decided to dedicate the full day to sewing the 6373. I have very mixed feelings about this one so would love to know if you have made it before – what did you think? It seemed to have a lot of steps in the bodice construction, and the majority of them were quite fiddly and I huffed a lot. The hem on the flounce was really small and difficult to get through the machine. I think that was partly to do with the fabric as it was so thin and my machine though it was quite tasty to eat. I had to think ahead a lot of the time so that exposed seams were finished properly; the instructions were hit and miss on including this step. The straps were really thin and I couldn’t turn them the right way round, so I ended up using a piece of pink ribbon for each strap. I also added a buttonhole + button for the back fastening as my elastic thread was far too stretchy to hold anything in place. I also got really confused when making the casing for the drawstring. The drawstring buttonholes were no where near the place where the casing was supposed to go so I ended up making a completely separate casing. I don’t think I was supposed to do that but I just couldn’t get my head around where it was supposed to go! Even after seeing if can wear it backwards (which I can’t) I’m still not getting rid of it – it’s been put in the pyjama drawer! Oh dear that is such a sad tale. But what smart pjs you have! All a learning experience. Meantime Growl! Oh no! The fabric is lovely though! Maybe re-visit it at a later time? I think I would like to try it again but i don’t think it will be soon as I now know how much of a hassle it is! Take some time, then revisit it. I’ve had to do that a few times. While waiting, I get a fresh perspective. Very disappointing 😦 I do laugh at myself every time I put it on!! What a frustrating experience! 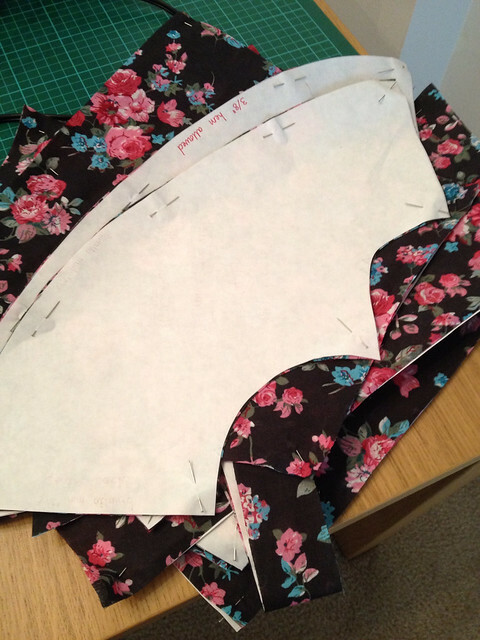 Such a cute pattern, shame it was such a struggle to put together. You have some super-cute PJs out of it, though, so at least it didn’t all go to waste. Very frustrating! It’s very comfy just to wear around the house so not all is lost! Oh dear, I’m feeling your pain… Does it look that obvious? Hard to tell in photos, if not could be lovely, floating around house and garden-wear too? Oh no! What a shame! The fabric is so pretty, it’s so disheartening when something like this happens! Beautiful fabric. But, don’t give up on the pattern. It is a really cute style for you and I think that it will go more smoothly next time around. Besides, a surprise pair of pj’s is always nice. aww my heart sank for you when I read your blog post 😦 What a shame. It is so discouraging when a sewing project goes wrong. I wouldn’t give up on it though, it looks great and that fabric is very pretty too. What cute pj’s it turned out to be, very nice floral! My similar story from long ago – made a princess dress (4 front, 4 back pieces). Sewed front — 2 f/ 2 b. Sewed back — 2b/ 2f. Seam ripper was busy for hours. Ahhh! What a bummer! My let-down moment is when I try it on and it doesn’t fit! I do like the fabric. 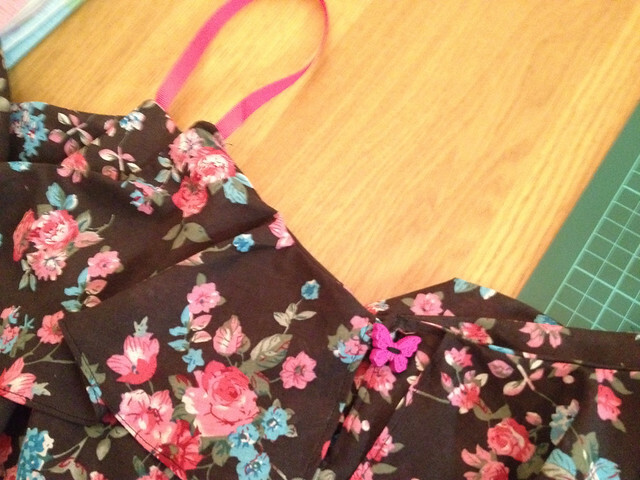 And there is always a seam ripper and lots of patience to give it another go…. It was a real let down moment but thankfully I’m over it now – I just laugh at myself overtime I wear it. I did think about unpicking it and re-stitiching but the cotton it quite thin and flimsy, I don’t think it would take it Lesson learnt for next time anyway!